Details: 2 BR, 2 BA,Vacation Rental, Sleeps 4. 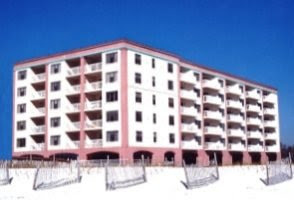 Sundune Village condo, Outer Banks beach rental at Kill Devil Hills. Sundune Village is the perfect condominium for friends or couples traveling together. It is large enough to be spacious while retaining a comfortable and intimate feel. This vacation property has 2 bedrooms, one with a King and one with a Queen and 2 full baths. The great room features plenty of comfortable seating and a flat screen TV for your favorite shows or a movie. A lovely slider to the patio can provide a moment of solitude or a perhaps the setting for a glass of wine shared between friends. The dining area has a comfortable table and 4 chairs. The kitchen with lovely wood floors is fully equipped and has a lovely breakfast bar with seating for 2. The Sundune Village community offers resort-style vacationing with a lovely in-ground pool, sun loungers and picnic area with park-style grills and tables. The Outer Banks, a popular vacation destination, are barrier islands on the coast of North Carolina, separating the Atlantic Ocean from the mainland. The Outer Banks beaches, state parks and shipwreck diving sites make them a popular family vacation destination. the Outer Banks area has 3 main sections: the Northern Beaches, consisting of Duck, Southern Shores, Kitty Hawk, Kill Devil Hills and Nags Head; Hatteras Island, consisting of Rodanthe, Waves, Salvo, Avon, Buxton, Frisco and Hatteras; and Roanoke Island, consisting of Manteo and Wanchese. Outer Banks outdoor activities include for surfing, boating, fishing and more along these barrier islands. Don’t forget about the freshest seafood anywhere, Outer Banks has exceptional choices for enjoying your favorite dish.